Stuart Russell received his B.A. with first-class honours in physics from Oxford University in 1982 and his Ph.D. in computer science from Stanford in 1986. He then joined the faculty of the University of California at Berkeley, where he is Professor (and formerly Chair) of Electrical Engineering and Computer Sciences and holder of the Smith-Zadeh Chair in Engineering. He is also an Adjunct Professor of Neurological Surgery at UC San Francisco and Vice-Chair of the World Economic Forum's Council on AI and Robotics. 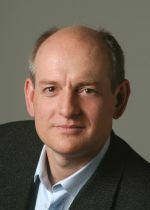 Russell is a recipient of the Presidential Young Investigator Award of the National Science Foundation, the IJCAI Computers and Thought Award, the World Technology Award (Policy category), the Mitchell Prize of the American Statistical Association and the International Society for Bayesian Analysis, the ACM Karlstrom Outstanding Educator Award, and the AAAI/EAAI Outstanding Educator Award. In 1998, he gave the Forsythe Memorial Lectures at Stanford University and from 2012 to 2014 he held the Chaire Blaise Pascal in Paris. He is a Fellow of the American Association for Artificial Intelligence, the Association for Computing Machinery, and the American Association for the Advancement of Science. His research covers a wide range of topics in artificial intelligence including machine learning, probabilistic reasoning, knowledge representation, planning, real-time decision making, multitarget tracking, computer vision, computational physiology, global seismic monitoring, and philosophical foundations. His books include "The Use of Knowledge in Analogy and Induction", "Do the Right Thing: Studies in Limited Rationality" (with Eric Wefald), and "Artificial Intelligence: A Modern Approach" (with Peter Norvig). His current concerns include the threat of autonomous weapons and the long-term future of artificial intelligence and its relation to humanity. B. Milch, B. Marthi, S. J. Russell, D. Sontag, D. L. Ong, and A. Kolobov, "BLOG: Probabilistic models with unknown objects," in Proc. 19th Intl. Joint Conf. on Artificial Intelligence (IJCAI-2005), L. Pack Kaelbling and A. Saffiotti, Eds., Rochester Hills, MI: IJCAI, Inc., 2005, pp. 1352-1359. D. Andre and S. J. Russell, "Programmable reinforcement learning agents," in Advances in Neural Information Processing Systems 13: Proc. 14th Annual Conf. (NIPS 2000), T. K. Leen, T. G. Dietterich, and V. Tresp, Eds., Bradford Books, Vol. 13, Cambridge, MA: MIT Press, 2001, pp. 1019-1025. T. Huang and S. J. Russell, "Object identification: A Bayesian analysis with application to traffic surveillance," Artificial Intelligence: Special Issue on Artificial Intelligence 40 Years Later, vol. 103, no. 1-2, pp. 77-93, Aug. 1998. S. J. Russell, "Rationality and intelligence," Artificial Intelligence: Special Issue on Economic Principles of Multi-Agent Systems, vol. 94, no. 1-2, pp. 57-77, July 1997. S. J. Russell and E. Wefald, "Principles of metareasoning," Artificial Intelligence, vol. 49, no. 1-3, pp. 361-395, May 1991.